Learn how to get a great looking lawn all season long! Having the perfect lawn requires some proper care and TLC on your part. 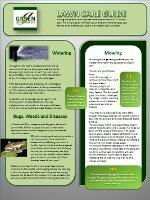 This simple guide will help you understand where to focus your efforts to ensure that you have a lush, healthy lawn all season.